The original Aegris was one of the few cards that I played around with on Photoshop and the ice to sand background inspired this card. 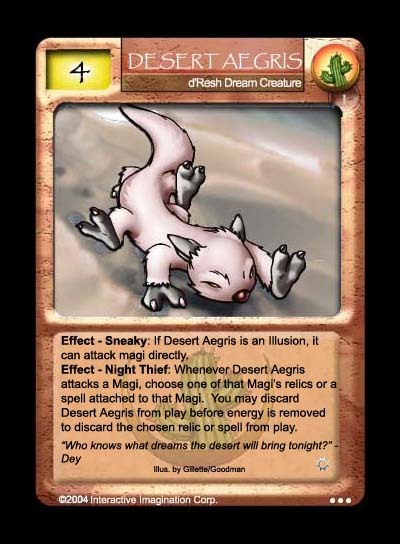 This Aegris retains the ability of its Nar cousin - discarding itself to do something as it attacks, but instead of discarding a creature this time, it discards a relic or a spell attached on a magi. Of course, if it was made illusionary, it won't be able to attack magi and would be at a stroke, be rendered useless, so it received text it always enable it to attack magi.